New York State Senator Charles Schumer has written a “I am not at all pleased with you, Apple” letter to Steve Jobs over the way Apple has responded thus far to the iPhone 4 antenna issue. 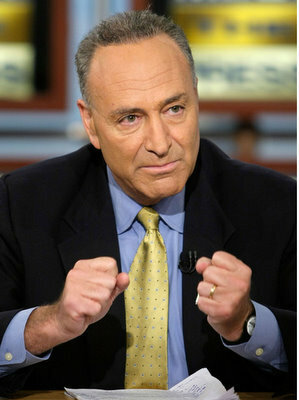 Senator Charles Schumer ‘expresses concern’ over the whole iPhone 4 reception issue and is less than pleased with the way Apple has responded – or I should say, the lack of response – to this issue. One of the biggest concerns that Senator Schumer expresses in his letter is the fact that Apple has yet to offer a ‘free of charge’ fix to the antenna and reception issue for current iPhone 4 owners, and finds it completely unacceptable of Apple to expect customers to have to pay their own money for a fix. I write to express concern regarding the reception problem with the Apple iPhone 4. While I commend Apple’s innovative approach to mobile technology and appreciate its service to millions of iPhone users nationwide, I believe it is incumbent upon Apple to address this flaw in a transparent manner. According to Consumer Reports’ review, released Monday on its website, the iPhone 4’s signal-strength problem is a hardwire glitch triggered by gripping the device in a particular manner. This finding, according to Consumer Reports, “call[s] into question” Apple’s recent claim that the problem is “largely an optical illusion caused by faulty software.” Consumer Reports declined to recommend the iPhone 4 because of this hardware design flaw. Given the discrepancy between Consumer Reports’ explanation of the reception problem and the explanation provided by Apple in its July 2 letter to customers, I am concerned that the nearly two million purchasers of the iPhone 4 may not have complete information about the quality of the product they have purchased. The burden for consumers caused by this glitch, combined with the confusion over its cause and how it will be fixed, has the potential to undermine the many benefits of this innovative device. To address this concern, I ask that Apple provide iPhone 4 customers with a clearly written explanation of the cause of the reception problem and make a public commitment to remedy it free-of-charge. The solutions offered to date by Apple for dealing with the so-called “death grip” malfunction-such as holding the device differently, or buying a cover for it-seem to be insufficient. These proposed solutions would unfairly place the burden on consumers for resolving a problem they were not aware of when they purchased their phones. I look forward to Apple’s swift action on this matter, and once again laud Apple for its innovative efforts and service to millions of Americans. Schmuck Schumer should worry more about running our State of New York than whine about an iPhone. Talk about a lame attempt at garnering publicity.